Amazon DynamoDB Firewall by DataSunrise ensures reliable security of corporate data from insider threats, hacker attacks and unauthorized access. Amazon DynamoDB Firewall provides strong SQL injection protection, data leak prevention and privilege management. 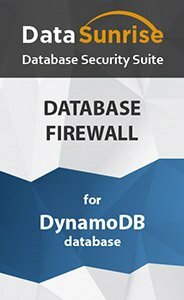 DataSunrise Amazon DynamoDB Firewall is a comprehensive security suite. It monitors database activity 24/7, records audit data in logs and blocks illegal access attempts. Amazon DynamoDB Firewall detects database weaknesses eliminating the risk of being exploit by malicious insiders or negligent employees. Special security rules are dedicated to privileged access management. This prevents data exposure to unauthorized users, as well as privileged user abuse. Being operated as a proxy, Amazon DynamoDB Firewall is deployed between a client and a database to intercept all queries addressed to Amazon DynamoDB and filter them according to preset security rules: it blocks SQL injections in real time, privileged right abuse, keeps record of what, who, why and when accessed Amazon DynamoDB, notifies a database administrator of all unusual actions that triggered security rules. DataSunrise Amazon DynamoDB Firewall can be integrated with Security Information and Event Management solutions to enhance database activity analysis. DataSunrise Database security, monitoring and compliance solution is a reliable Amazon DynamoDB Firewall to protect cloud data and applications.